In the fact of the rising electoral strength of BJP, particularly after it massive victory in 2014 General elections, its coming to power in different states and its rising electoral support even in places where earlier it was absent, has shaken up many a parties at different levels. It is in this context that the interview of Com Prakash Karat (The Hindu, November 29, 2017) becomes significant. Karat in his interview makes some substantial points to ponder. He says that BJP replacing Congress as the dominant political party has to be kept in mind while planning the future moves. Also that due to its policies during last few years; there is a great amount of discontent which is manifesting in the form of disenchantment of its earlier support base of traders and section of middle classes. There is a great turmoil among workers and farmers which is manifesting itself in the form of agitations which are not being reported in the media. Struggles of dalits and the scenario in University campuses are also significant signs of resistance. So as per Karat there is a need to project an alternative to BJP. 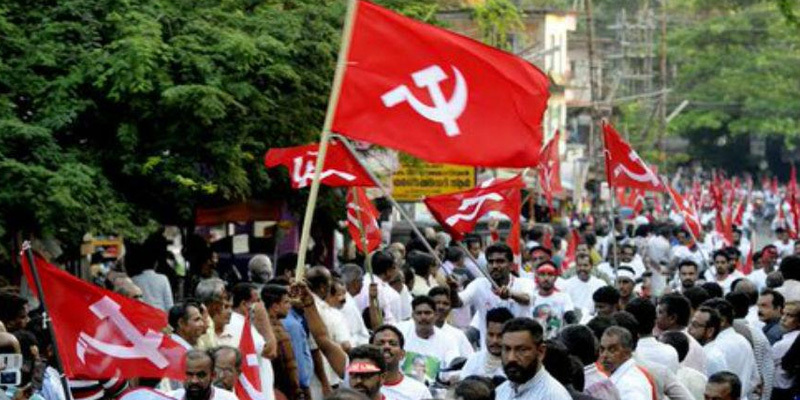 While he rightly calls for the need of joint struggles, need for broad platforms of social groups to have joint agitation, where he flounders seriously is his conclusion that CPI (M) cannot be a part of an alliance with Congress. This is also related to his understanding that the present BJP regime is not a fascist regime but an authoritarian-communal one which is indulging in increased number of fascistic type attacks. Karat is unable to characterize the present scenario and its dangerous potential to the full extent. The reality is that we are being pushed gradually towards Hindu Rashtra, the agenda of RSS combine. The events of last three years matter not just at electoral level but are affecting the state, our institutions, our Universities, our education system and the pattern of economic policies. The hegemony of Hindu nationalist ideology has grown up by leaps and bounds. We can see that identity based issues, Ram Temple, Mother Cow and love jihad are increasing in intensity. Cow related issues have resulted in the killings of so many Muslims, have led to abominable flogging of dalits in Una and killings of others related to cattle trade. Minorities are being targeted through issues like Love Jihad and Ghar Wapasi. The heavy handed, ultranationalist policies in Kashmir have resulted in massive casualties. The series of Award Wapasi did reflect the anguish of our intellectuals-artists-writers about the growing intolerance. The targeting of religious minorities has gone to the extent that many a leading thinkers from Muslim community think it is better not to be part of the electoral machinations, as it is further used by communal forces to polarize the society. Our media has either come under total control of Corporate World or is manipulated enough to black out the news about resistance struggles of workers, peasants and dalits. Is it mere authoritarianism as he will like us to believe? Authoritarianism is imposed from the top. Here we see the mass mobilization increasing in intensity and stifling the democratic space. The foot soldiers of Hindu nationalism are being let loose. The point is that Hindu nationalist agenda has been made to flow in full strength; increasing its stranglehold. This mass participation in implementing this agenda is what distinguishes the present system from authoritarianism. So what are the key components of the BJP regime today? There is a massive support of Corporate World, the state institutions are being compromised at a rapid pace, the ultranationalist policies very visible in Kashmir, in Universities, in imposition of Vande Matram, in bringing up of issues like all have to shout the slogan ‘Bharat Mata ki jai’, the targeting of minorities and the stifling of liberal space. All this is being achieved in a two directional process of mass mobilization through emotive issues promoted and propagated by different wings of RSS Combine and a top down imposition due to the simple majority of BJP at the centre. While dissatisfaction of the people is picking up, the mobilization and abuse of identity issues for political goals is still at the forefront. A section of society has been totally sold over to by the charismatic construction of Narendra Modi’s persona. It is also true that lately the halo around him is diminishing in quantum, but still it is glaring. So the struggle is not just at electoral level but has to be a total one, cultural, economic, and political and what have you. Still the battle on the electoral level is also decisive. While RSS has been doing its work from last close to a century, its work has found roots more so after the decade of 1980s. While it was communalizing the society at slow pace earlier, now the speed has picked up tremendously during last over three years. Now it gets all the paths clear from Governmental and administrative side. It is an absolute must that such electoral formations need to be kept aside if the democracy is to fructify on secular plural grounds. True that Congress has many policies, which one cannot and should not sit with. As in UPA I a common minimum program can be the path for coming together, to sew a broader coalition. It’s true that there are difficulties in such a coalition. There have been positive and negative sides of Bihar Mahagathbandhan experiment, some parties cannot be brought on board due to their contrary social base, and still there are many political parties with which left can shake hands to confront the rising tide of Hindu nationalism. On economic policies there is also a possibility of an interim understanding on these, without compromising the interests of workers, dalits and farmers. The space available for the non communal parties is not much, but whatever little space is there is to be used to broaden the fight for ensuring that Hindu nationalism is countered. The Hindu nationalist politics is not just authoritarian politics, as Karat says. It has features closer to fascism. It has to be combated with electoral alliances, Congress included.